Gerry Cox, COO, will be in attendance at INTERPHEX 2019 in New York City, NY. Gerry Cox, COO, will be visiting DCAT week 2019 in New York City, NY. Velesco will be exhibiting for our 11th consecutive year at AAPS PharmSci360 in Washington, D.C. Come visit booth #2415! Velesco will be sponsoring the 2018 MichBio Expo in Ann Arbor, MI. See the Expo Agenda, here. Velesco Pharma announces the expansion of our analytical and formulation facilities to a new location in Wixom, MI! Read the press release. COO Gerry Cox will attend the 2018 Contract Pharma Conference in New Brunswick, NJ. Velesco COO Gerry Cox will be attending the 2018 BIO International Convention in Boston, MA. Read about the convention here. COO Gerry Cox will be attending CPhI North America's 2nd annual conference in Philadelphia at the Pennsylvania Convention Center! Velesco will be exhibiting at the 2017 AAPS Annual Meeting and Exposition in San Diego for our tenth year! Come see us at booth #2706. 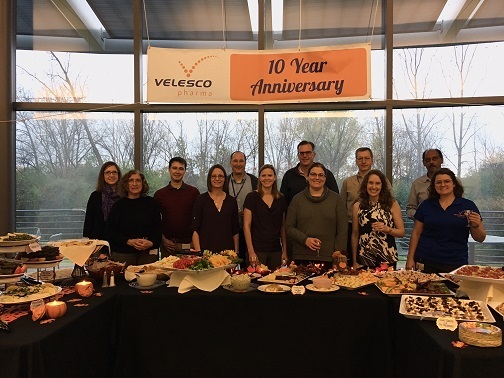 Velesco celebrated our 10th Anniversary with a party at the Michigan Life Science and Innovation Center! Thanks to all who joined us! Gerry Cox, Velesco Pharma's COO, lead a round table discussion on the journey from "Startup to Second Stage" at the 2017 Massbio CRO/CMO Symposium. Velesco is sponsoring the 15th International Nanomedicine and Drug Delivery Symposium at University of Michigan in Ann Arbor. Come see us!! Velesco will be exhibiting at the MichBio Event: Women Building Success in Biosciences in Ann Arbor. Come see us! Velesco will be exhibiting for our ninth consecutive year at the 2016 AAPS Annual Meeting and Exposition in Denver! Please visit us at booth #237. Velesco will be exhibiting for our eighth consecutive year at the 2015 AAPS Annual Meeting and Exposition in Orlando at booth #2063! Velesco's COO Gerry Cox will be providing leadership to a team launching a new series of CRO/CMO educational forums at MassBio. The first forum will be held on Tuesday, September 15, 2015. Velesco's CSO Dave Barnes was a speaker at MichBio's event: Drug Discovery Symposium in East Lansing, MI! Velesco sponsored and attended MichBio's event, Women Building Success in Biosciences in Ann Arbor, MI. Velesco attended Pharcon Japan 2015, part of Life Science World 2015! Velesco's PMP Lisa attended the Project Management Institute Great Lakes Chapter Annual Spring Symposium! Velesco will be exhibiting at the 2014 AAPS Annual Meeting and Exposition at the San Diego Convention Center, in San Diego, CA. Please visit us at booth # 3925. Velesco will be honored at the Sixth Annual Corporate Welcome Reception to be recognized as a new company in Massachusetts.This high profile event will be held at Genzyme's headquarters in Cambridge. Velesco will be attending the Global Clinical Supplies Group meeting in Savannah, GA on April 27-30. Velesco will be exhibiting at the 2013 AAPS Annual Meeting in San Antonio, TX on Nov 10-14. Come see us at booth 2846. Velesco will be exhibiting at the Contract Pharma 2013 Contracting & Outsourcing Conference in NJ. We are located in booth 29. Velesco will be attending the 2013 BIO International Conference in Chicago on Apr 22-25. Come see us at the Michigan Pavilion. Velesco will be attending the 2013 Global Clinical Supplies Group meeting in New Mexico on Apr 21-24. CEO Dave Barnes will be a panelist at Washington Biotechnology and Biomedical Association's Chemistry Manufacturing and Controls Forum. Seattle, WA. Velesco will be exhibiting at the 2012 AAPS Annual Meeting in Chicago, IL on Oct 15 - 17. We are located in booth 1903. Velesco will be exhibiting at the Contract Pharma 2012 Contracting & Outsourcing Conference in NJ. We are located in booth 34. Velesco will be attending the 2012 BIO International Conference in Boston, MA. Come see us at the Michigan pavilion. Velesco will be attending the 2011 MichBIO Expo and Conference in Grand Rapids, MI on Nov 2-3. Velesco will be exhibiting at Contract Pharma Magazine’s 10th Annual Contracting and Outsourcing Conference at the Hyatt Regency in New Brunswick, N.J. on Sept 22-23, 2011. COO Gerry Cox is attending the 2011 International BIO Convention in Washington, DC. Visit him at the Michigan Pavilion, booth 1337. Velesco will be exhibiting at the 2010 AAPS Annual Meeting in New Orleans on Nov 14 - 18. Please come visit us at booth 1246! Host: MPI Research, in collaboration with Bioject Inc. Description: Learn about the challenges, opportunities, and common themes in this dynamic arena from leading experts. Velesco will be exhibiting at Contract Pharma Magazine’s 9th Annual Contracting and Outsourcing Conference at the Hyatt Regency in New Brunswick, N.J. on Thursday Sept 23rd. Please come visit us at table #137! CSO Dave Barnes will be speaking at a symposium "The Power of Outsourcing in Early through Preclinical Drug Development" held in La Jolla, CA. Velesco will be exhibiting at the New York Biotech Association Annual Meeting, New York Marriott Marquis. Velesco will be attending the Society of Toxicology Annual Meeting and ToxExpo in Salt Lake City, UT. Velesco will be attending the ACT (American College of Toxicology) 30th Annual Meeting, Palm Springs, CA. Local company MPI Research, in collaboration with MichBio and the Van Andel Institute, presents Novel Therapeutic Biologics: Innovative Molecules and Mechanisms. Learn about the challenges, opportunities and common themes in this dynamic arena from leading experts at this 4th annual educational symposium. Click here for more information. Velesco will be exhibiting at the 2009 BIO International Convention in Atlanta, visit us at the Michigan pavilion, booth #3147. Velesco will be exhibiting at the Interphex conference in New York CIty, booth #579. Velesco will be attending the InformexUSA 2009 conference. Velesco Pharmaceutical Services will be exhibiting at the annual AAPS Conference in Atlanta, GA. Our scientists will be present at our booth (#2452) throughout the exposition to answer your questions about our capabilities and any other matters you wish to discuss. Velesco Pharmaceutical Services will be exhibiting at the 2008 BIO Conference in San Diego, CA. Our booth will be in the Michigan state pavilion (#643).